Well I do have to say that my favorite which has blond hair with highlights, and a golden California tan! But that’s not to say I don’t love the classic goth look for witches. I so do! This adorable photograph exemplifies the look. If you want to get your goth goddess on fire, here a few classic ingredients you will need. First of all, goth hair. Some women like the bright-colored streaks but unless you are really gorgeous, bright pink or orange hair can wind up being an eyesore. Jet black is always a good option. Just be warned that you never know how jet black hair is going to look on you until you’ve tried it. Dying your hair permanently black is a very big no-no because it is extremely difficult to strip out the black color and it can wreck your hair getting rid of it. Try an easy temporary wash in hair dye first so you can try out the look without having to commit. I love her nice long hair coupled with the Betty Page style classic banks. Along with the jet black hair you are going to combine a paler base makeup to get the snow-white contrast going. Use lighter concealer and foundation. Then give everything a pop with black lined eyes and a good application of mascara. Cover Girl 1, 2 mascara is great for goth eyes. The one side of that mascara gives you a good application of it, and the other side gives you plenty of volume. It comes in a giant pick tube at your local drug store. 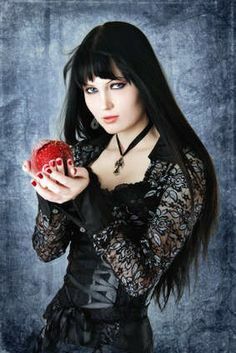 To complete the look wear lacy black clothes, red-painted nails, and a goth style necklace. A black or jewel colored ribbon with a favorite relic looks wonderful with this sweetheart lace black top she is wearing. So to get the look of goth, try a temporary black hair dye such as ColorSpa. Apply makeup on the paler side to get a contrast. Accentuate eyes with black liner, and use orange or reddish lip stain. Red painted nails and a black lacy dress or top complete the look. Black hair is hard to pull off, because it can look harsh on haggard skin. So make sure to use plenty of concealer and pressed powder to get a polished looking finish to your makeup. Some women turned themselves into beauty queens going black. The perfect example is Megan Fox. Her natural hair color is a dirty blond but black goth hair color turned her into a movie star siren. Witches love to get into costume, observe, and partake in rituals. Add to the fun by exploring different looks. Let your inner beauty come out because it’s uplifting and super fun to do!